What is a Global Platform? Having arrived in Geneva last week, despite the hares who delayed our flight so that they could ‘have a punch up’ on the runaway , I went straight to the Center of International Conferences Geneva (CICG) for the 2013 Global Platform for Disaster Risk Reduction. This bi-annual meeting aims to support the implementation of the Hyogo Framework for Action 2005-2015 (HFA). Despite my deep interest in disaster risk reduction and its less technical but currently more popular stepbrother ‘resilience’, my main concern was to figure out what a ‘global platform’ consisted of. In this post I’m going to share a couple of highlights from the conference, before turning to the question which these conferences always leave me with – what next? The conference consisted of numerous panel sessions, side events where discussions took place, a smaller stage where organisations could present their work and numerous stalls with thousands of reports and pamphlets for participants to collect. The conference was genuinely diverse with attendees from all over the world and interpretation available from numerous different languages (including Japanese). But the question I was left with – as is often the case – was: what next? 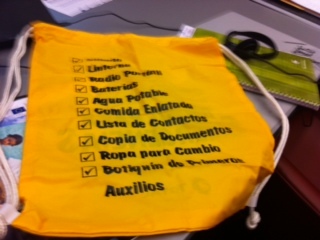 This ‘emergency bag’ (or ‘grab bag’ as many of us in the sector call it) is provided to every family in the region. The list displayed in the photo above outlines all the items that must be placed in the bag and kept stocked up in case of emergency. When a disaster strikes, the family can pick up the bag, place it on one of their backs and flee to the pre-designated meeting point safe in the knowledge that they have all the vital equipment necessary to survive. For me, the other key message is that the government cares and that someone is thinking of them during this time of need. During one side event, a corporal from the First German/Netherlands Corps talked about the potential role that the military can play during emergencies. This included both expertise in training and ready trained personnel. There was much discussion about how well the military and civilian rescue teams currently worked together with several members of the audience ‘heckling’ that in their countries the partnership worked extremely well. The lively debated ran over schedule but they did seem to conclude in agreement that the central components for success were trust, good communication and a shared understanding of each entities objectives and priorities. One of the most crowded side events was the one on food security in Africa. A distinguished panel from across Africa (Zimbabwe, Niger, Senegal) and almost all the UN nutrition related agencies (WFP, FAO, UNICEF) outlined the relevance of nutrition and food security to the wider resilience agenda. In fact, almost all agreed that without a more explicit acknowledgement of these issues in the next HFA, disaster affected communities would never be truly resilient to future shocks. In answer to my own question: a global platform is a physical space where actors from around the world can share their experiences, seek future support, sympathise with one another and propose improvements going forwards. I wonder whether it would be possible to calculate the economic value of these conferences. The cost is enormous. Those who attend learn from other nations and have the opportunity to network. But throughout the conferences many participants can be seen responding to their daily emails. I can’t help but question what real value will have been produced aside from the recognition and exposure through the media and conference events of those working hard on the ground and the reward through a fun foreign trip. But maybe I’m too sceptical . . . I look forward to seeing the round of negotiations for the next HFA when the impact of this Global Platform may very well become apparent. Finally, a quick link back to previous posts on this blog. 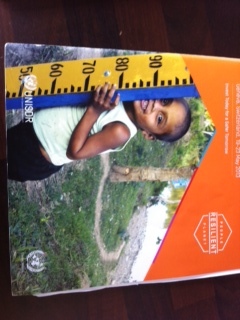 The main image for the conference was a beautiful photo of a smiling boy leaning against a water level measurement post. The photo comes from Nicaragua and highlights the use of early warning systems in rural communities. Taken by a member of Oxfam GB we can safely assume that photography rules were followed and the small boy gave his permission before his face was captured on film. However, I wonder how he would feel to see his small body blown up on the side of this building in Geneva? Thanks a lot for giving yourself the time to produce and share such interesting report about the Global Plattform, 2013.